Genuine OEM Canon Toner Cartridge, Black, High Capacity 69,000 page yield. Canon part number: 0481C003, 0481C003AA, GPR-55BK. Laser Toner Cartridge compatible with Canon imageRUNNER ADVANCE C5535i, C5540i, C5550i, C5560i. Genuine OEM Canon Toner Cartridge, Cyan, High Capacity 60,000 page yield. Canon part number: 0482C003, 0482C003AA, GPR-55C. Color Laser Toner Cartridge compatible with Canon imageRUNNER ADVANCE C5535i, C5540i, C5550i, C5560i. Qualifies for free shipping & earn 229 points! Genuine OEM Canon Toner Cartridge, Cyan, 26,000 page yield. Canon part number: 0485C003, 0485C003AA. Color Laser Toner Cartridge compatible with Canon imageRUNNER ADVANCE C5535i, C5540i, C5550i, C5560i. Genuine OEM Canon Toner Cartridge, Magenta, 26,000 page yield. Canon part number: 0486C003, 0486C003AA. Color Laser Toner Cartridge compatible with Canon imageRUNNER ADVANCE C5535i, C5540i, C5550i, C5560i. Genuine OEM Canon Toner Cartridge, Yellow, High Capacity 60,000 page yield. 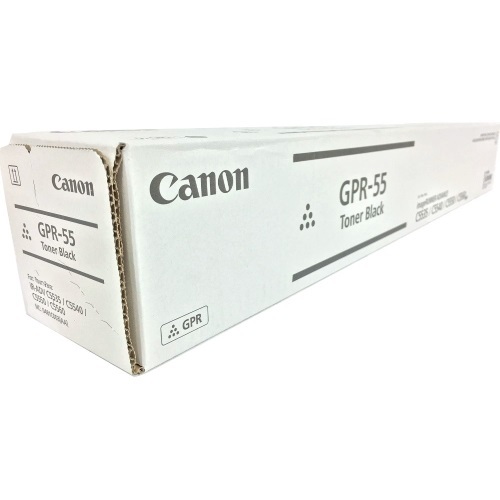 Canon part number: 0484C003, 0484C003AA, GPR-55Y. Color Laser Toner Cartridge compatible with Canon imageRUNNER ADVANCE C5535i, C5540i, C5550i, C5560i. Genuine OEM Canon Toner Cartridge, Yellow, 26,000 page yield. Canon part number: 0487C003, 0487C003AA. Color Laser Toner Cartridge compatible with Canon imageRUNNER ADVANCE C5535i, C5540i, C5550i, C5560i. Genuine OEM Canon Drum Unit,. Canon part number: 0488C003, 0488C003BA, GPR-55. Drum Unit compatible with Canon imageRUNNER ADVANCE C5535i, C5540i, C5550i, C5560i. Qualifies for free shipping & earn 819 points!